Tag Archive | "Time Travel Through The Decades"
Students sang class, group and solos during the hour-long performance. 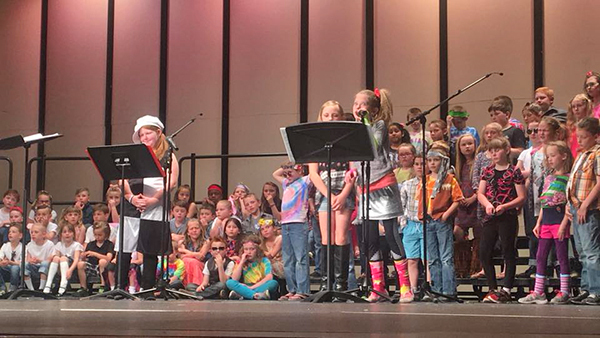 The kindergarten through fifth grade students came together to perform their spring musical after months of hard work. Jukebox Time Machine: A Presentation of Hits Through the Decades transported the audience through song, dance and skit from the 50s on through the 90s. Songs including Splish Splash, Dancing Queen and Don’t Stop Believin’ had the audience tapping their toes to the upbeat tunes as it brought back memories of their childhood days. Students were assigned a decade for their attire and they came in poodle skirts and saddle shoes for the 50s, tie dye and bell bottoms for the 70s and grunge and pop for the 90s. Fourth grader Leda Gitchel played Roxie the time machine tour guide who explained all of the different eras. The concert was conducted by Mr. Jeremy Holtrop.